I was recently trawling through the newspaper archives on Find My Past and came across the article below from the Leeds Intelligencer of 17 January 1928. I soon realised that this looked suspiciously like my relative James Ernest Gawthrop, my 2nd cousin 3x removed. His parents were Thomas Gawthrop and Christiana Hey. Our common ancestors were John Gawthrop and Sarah Brown, my 4x great grandparents. I already had a bit of information about James – I know for example that he was born in 1887 – his birth is registered in Q3 in Keighley, West Yorkshire. As far as I can tell James was the youngest of nine children. In the 1901 census, at the age of 13 James was working as a “worsted spinner and doffer”. Sometime in the summer of 1909 James married Annie Morris in Halifax. 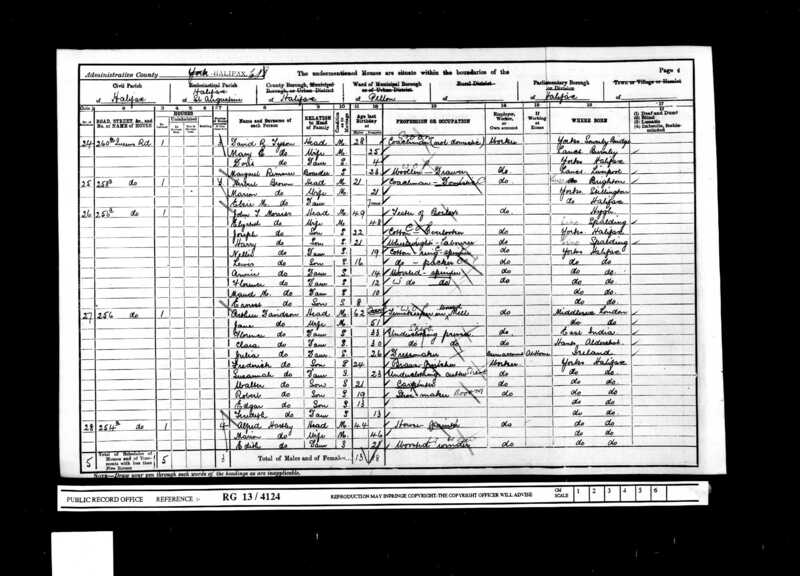 In the 1911 census James and Annie are living in Keighley with their son Benjamin (born in 1910) and James is employed as a “mohair warehouseman”. They had two more children – Nellie in 1912 and Lewis in 1914. I assume that James served in WW1 but I can’t find any remaining military records for him on either Ancestry or Find My Past. I already knew that James died in 1928 and his death was registered in Q1 in Hemsworth, Yorkshire. This is supported by the newspaper article in terms of date and location. 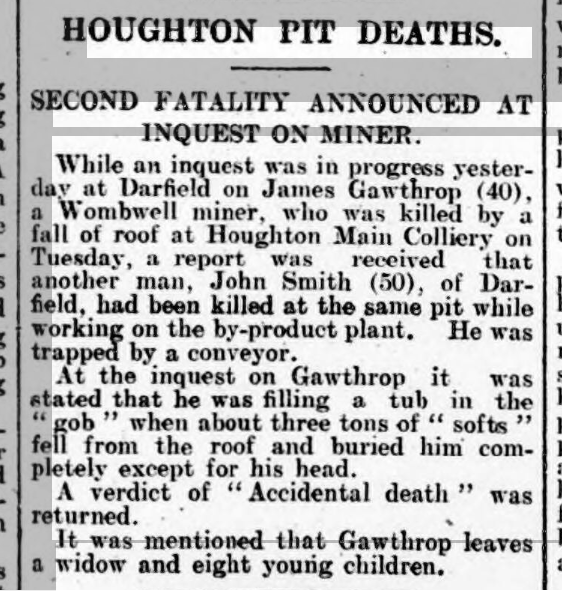 However there is one obvious discrepancy – the newspaper report says that “Gawthrop leaves a widow and eight children”. That clearly doesn’t agree with the information I already had. So what’s going on? I decided to do a bit more digging. I found a death record for Annie Gawthrop registered in Keighley in Q2 of 1914. That was the same quarter that the birth of Lewis was registered. Had Annie died in child birth? That’s certainly a possibility. Next I found another marriage for James E Gawthrop – this time to Maud M Morris registered in Q2 1919 in Halifax. OK, same surname as Annie and same location as the marriage to Annie. Is this just a coincidence? A bit more digging required I think. Searching the 1891 and 1901 census returns for Halifax and things started to look a bit clearer. Below is the 1901 census clearly showing Annie Morris (14) and Maud M Morris (10) – sisters. Interestingly there are two other siblings called Nellie and Lewis – the same names that James and Annie gave two of their children. Their other son Benjamin was probably named after James’s grandfather Benjamin Gawthrop. So I am as confident as I can be that I now understand what happened here. James married his sister-in-law. After James died on 3 January 1928 Maud Mary married William Martin sometime in Q4 1928, this marriage is registered in Barnsley. There is a death record for Maud M Martin registered in Halifax in Q2 1957. So without any certificates I can’t confirm any of this but it makes for an interesting story anyway. I suspect that after Annie died in 1914 maybe James was called up for service in WW1. Perhaps Benjamin, Nellie and Lewis went to live with Annie’s parents in Halifax while James was away. When James came back home romance blossomed between him and Maud Mary. The rest as they say is history!! Arthur Dawson is my 1st cousin 2x removed – our common ancestors are my 2x great grandparents John Dawson and Ellen Gawthrop. Arthur is the brother of Prince Dawson and John Dawson – his parents are John Dawson and Elizabeth Bradley. He was born 18 July 1879 and lived at Steeton with Eastburn about three miles from Keighley, West Yorkshire. Before I found his WW1 service records I knew that Arthur married Lily Cockshott sometime in Q2 1906 and their marriage is recorded in the Keighley registration district. 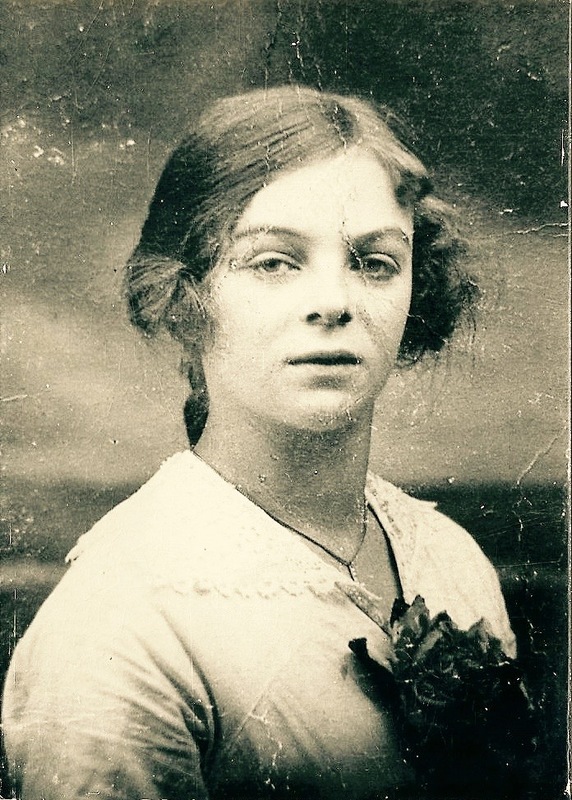 They had one child – a son, Eric born in 1909. Arthur enlisted on 30 August 1916 in Keighley and was assigned to 7th West Yorkshire Regiment. His service number is 238029. He was 37 years old. 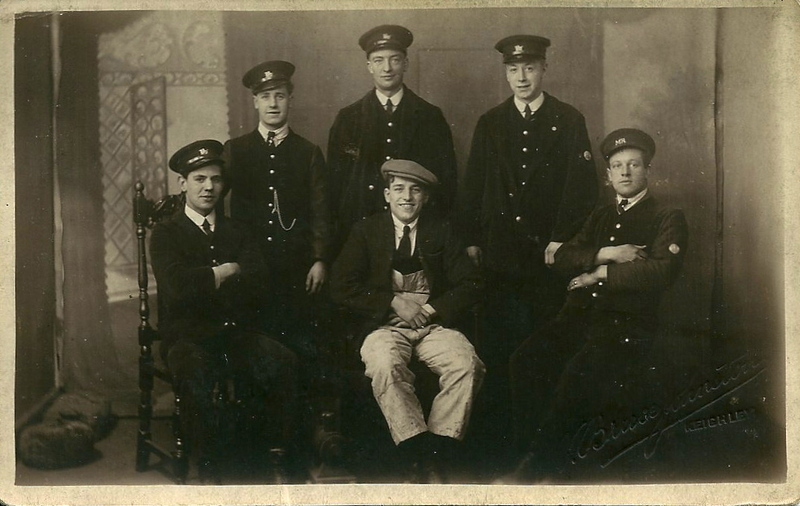 At the time of his conscription he was living at 19 School Street, Steeton with Eastburn. His trade is given as ‘mason’. The enlistment documents also show that Arthur had previous service in the Royal Engineers. 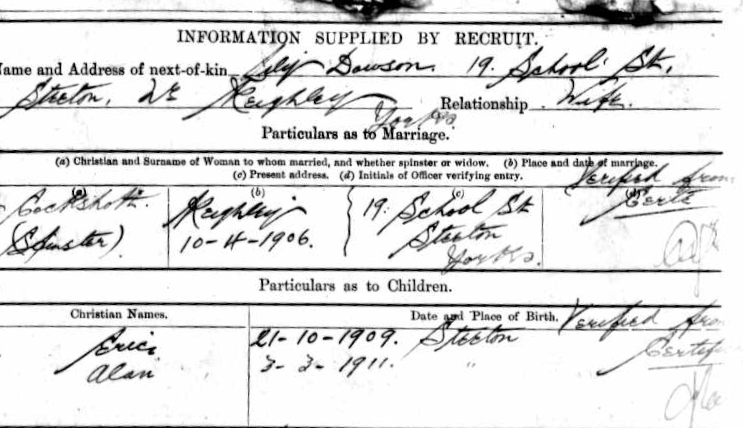 His service papers provided confirmation of the date of marriage to Lily – 10 April 1906. They also give Eric’s date of birth as 21 October 1909 – so more information for my tree. However his service record through up a bit of surprise. There is another son shown – Alan with a date of birth of 3 March 1911. I have the 1911 census record for Arthur, Lily and Eric – but no Alan. I have been able to find a birth for Alan Dawson at the right time and in the right location but no trace of him in the 1911 census. So, I searched for a death and found a record for Alan Dawson who died in Leeds in 1977 with a date of birth given as 3 April 1911. Could this be the answer to my conundrum? Maybe 3 March 1911 was incorrect. The 1911 census was undertaken on the night of 2 April 1911. So Alan could have been born the following day and that is why he is not recorded. I’m happy with this solution and have now added Alan to my family tree. Anyway, back to Arthur and his war service. It seems that Arthur was at home until 3 January 1917. The following day he embarked for France, returning home again after 105 days on 18 April 1917. There is reference to him serving in the Royal Defence Corps (RDC) – the role of this regiment was to provide security and guard duties inside the United Kingdom. Arthur was finally discharged on 23 March 1919.